This is my finished Easter Lemon house, instead of using ginger in the recipe I used the zest of one of my home grown lemons to add a lighter, fresher taste to the house for spring. I found the mini sized eggs in Morrisons and I added some plastic bunny cupcake toppers that I had. I tried to ice some growing greenery and flowers onto the house as well. I was very lucky to be sent the Fairy Tale Cottage Mould to review from Lakeland. The kits is traditionally marketed as a Christmas product but as I am partaking in the Seasonal Gingerbread House Challenge I wanted to try it for my Easter house. The kit comes with silicone moulds, to make the components of one house, two piping bags, and the recipe to make either a gingerbread or chocolate house. The gingerbread was very easy to make, I made mine with golden syrup and substituted white sugar for the brown sugar and used lemon zest instead of ginger powder. The kit is exceptional easy to use and makes a really impressive looking house. The gingerbread made is solid enough but still a little soft and I had no problem gluing it all together with royal icing. The finished house is very stable. The kit costs £11.99. Just to mention a little about Lakeland, I love their products, they are inventive and creative. An extra bonus is the fact that the products come with a long term guarantee. If you end up unhappy with a product they have a no quibble returns policy even if you have had the product for a long time. I make sure I buy most of my standard kitchen, and home stuff from here as it is really handy to have that reassurance. For example I bought my Kenwood Prospero mixer from Lakeland knowing that I have that extra peace of mind. As Lakeland is a company I buy from a lot, and trust, I have signed up to the Lakeland affiliate programme as a trial so you may see a few ads on my site. If you click through and buy something I receive 4% commission. 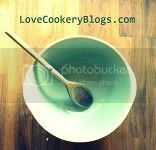 It would be fantastic to earn a little money towards ingredients and bits for the blog. I promise that is all I am going to say! I am submitting my Easter house to the Seasonal Gingerbread House link up, this month hosted by Jaime at Jaims' Kitchen. Do join in we would love to see your creations! We don't mind how you make your gingerbread house. If it is chocolate, cake, biscuit or part of a premade kit. You are welcome to resubmit old posts just please add the badge and link back to here. I really like your piping detail on the side of the house, it looks very pretty. I also like the sound of a lemon house instead of a gingerbread house, nice and refreshing for what is apparently supposed to be spring! What a great house you made. I would never have thought of those great changes you made. I too love Lakeland products, whenever we're in the U.K. I always make sure we visit their store.